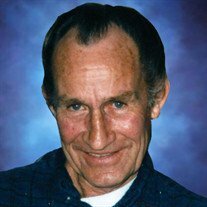 William Earl "Bill" James, 83, of Russellville, died Monday, September 10, 2018 at St. Mary's Regional Medical Center. The son of Hobert James and Lela (Apple) James, he was born November 3, 1934, in Havana. He operated Kerr-McGee service station, the last full-service station in town, on the corner of West Main and Skyline for many years. It was a local hang-out for many friends and customers, where he enjoyed visiting and playing his guitar. He also enjoyed fishing, pheasant & deer hunting, playing horseshoes and gardening. He was preceded in death by his parents; brothers, J.W. and Bobby Joe James; and sisters Ima Dale Crabill and Lorene Earls. Survivors include two daughters, Teri Ward and husband Tim and Tami Hollowoa and husband Butch, both of Russellville; five grandchildren, Shannon Taylor and husband Andy of Russellville, Ryan Ward and wife Paige of Dardanelle, Carly Robinson and husband Garrett of Pontoon, Derek Hollowoa and Blake Hollowoa, both of Little Rock; three great-grandchildren, Mylah Robinson, Raelynn and Bryar Ward; and one brother, Floyd James of Havana. Funeral Service will be held at 2:00PM, Friday, September 14, 2018, at Humphrey Chapel. Reverend Steve Lawrence will officiate. Burial will be at Piney Cemetery in Havana by Humphrey Funeral Service. Visitation will be 6-8PM, on Thursday, at the funeral home. Internet obituary and on-line guest book are available at www.humphreyfuneral.com.